Most of Cornell’s W, Y, RB and H series clear liquid pumps can be used in hot oil applications, allowing for flows up to 7,000 GPM and heads up to 540′. 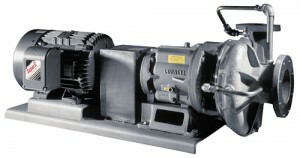 Enhanced vapor handling and improved sealing technology are central to Cornell’s latest hot cooking oil pump innovations. When fresh product passes through a fryer, water tends to travel along the bottom of the fryer in a liquid phase at 392°F (200°C), until it reaches the pump suction where the action of the impeller breaks up the water into smaller droplets that flash into steam. Ordinarily, entrained steam would impair the pump’s head and flow, but Cornell’s innovative anti-cavitation system prevents this situation.